"Who's going to take care of me?" A24 has revealed another new trailer for the acclaimed horror film Hereditary, which premiered at the Sundance Film Festival earlier this year. This trailer focuses on the Charlie, the young daughter in the film, played by Milly Shapiro - you can even buy her weird "creations" on Etsy here. From writer/director Ari Aster, Hereditary is about a close family that starts to unravel following the death of their reclusive grandmother. As an overwhelming terror takes over their household, their peaceful existence is ripped apart, forcing their mother to explore a darker realm in order to escape the unfortunate fate they've inherited. Toni Collette stars, along with Gabriel Byrne, Alex Wolff, Ann Dowd, and Zachary Arthur. This film is incredible, and will be one of the big breakout horror hits this year, for sure. Don't miss it when it comes to your local cinema - it's not only terrifying to watch, but an extremely impressive film between performances and cinematography and script. Take a closer look below. You can still watch the first official trailer for Hereditary here, for even more footage from this film. From Jordan Raup's Sundance review found on The Film Stage: "Aster displays proficient skill in eerie tone-setting, elaborate production design, and the type of scares that will leave a pervasive imprint on the mind." When Ellen, the matriarch of the Graham family, passes away, her daughter’s family begins to unravel cryptic and increasingly terrifying secrets about their ancestry. The more they discover, the more they find themselves trying to outrun the sinister fate they seem to have inherited. Making his feature debut, writer-director Ari Aster unleashes a nightmare vision of a domestic breakdown that exhibits the craft and precision of a nascent auteur, transforming a familial tragedy into something ominous and deeply disquieting, and pushing the horror movie into chilling new terrain with its shattering portrait of heritage gone to hell. 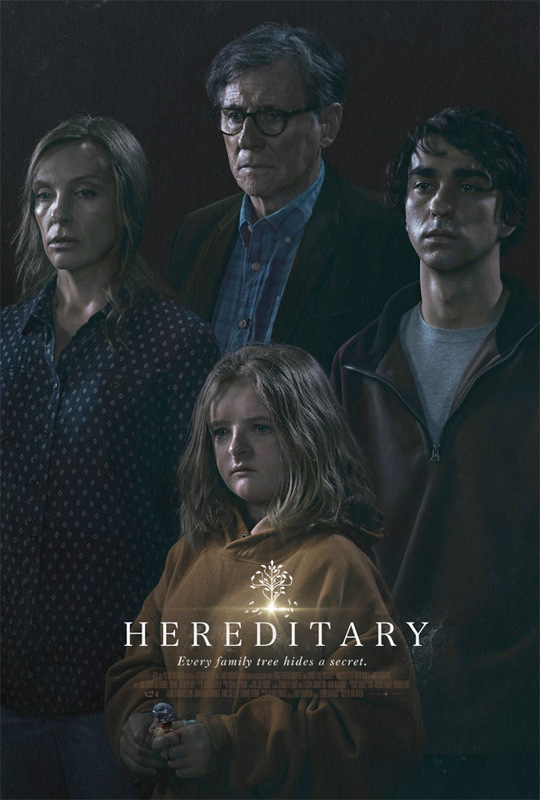 Hereditary is both written and directed by American filmmaker Ari Aster, making his feature directorial debut after a number of short films. This first premiered at the 2018 Sundance Film Festival this month. A24 will open Aster's Hereditary in select theaters starting June 8th, 2018 this summer. Who's in?